From KATSU’s Remember the Future, 2015. Since the Federal Aviation Administration (FAA) first authorized the use of unmanned aircraft in 1990, noncommercial operation thereof has been relatively unregulated. As a result, artists in the United States have long had free rein to utilize drones in their artwork. However, this freedom may come to an end before the end of 2015. The Chairman of the House Transportation and Infrastructure Committee, Representative Bill Shuster, R-Pa., said in December of 2014 that Congress would prioritize overhauling aviation policy and reauthorizing FAA programs in 2015. In January The Art Newspaper reported that the FAA is planning to submit new restrictive drone regulations to Congress by September. Drones have become relatively affordable and available to lay consumers over the past few years; the DJI Phantom, the world’s bestselling drone model, is now available for $479 on Amazon.com. As such, the proportion of drone operators who are artists has been increasing relative to the original user base of aviation enthusiasts. 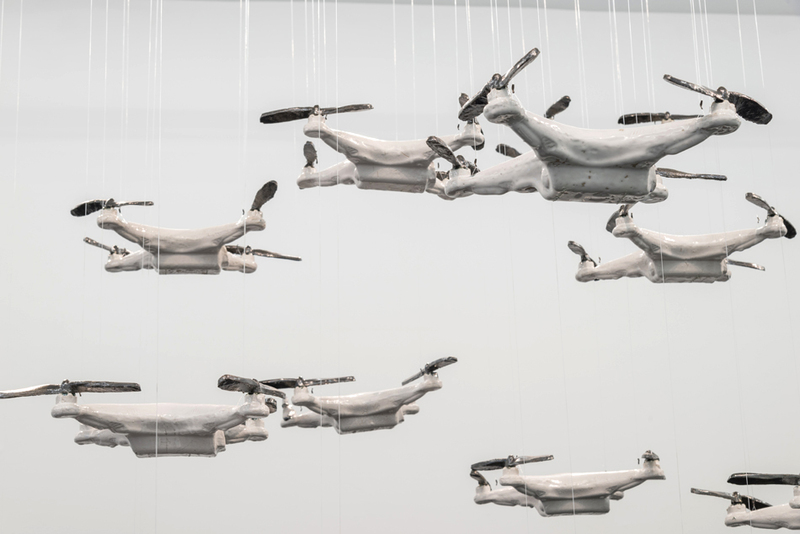 Notorious for pushing boundaries of the permissible and possible, artists have used drones as a subject of art (such as in James Bridle’s political commentary “Drone Shadow”), an instrument to create art (as in works by Addie Wagenknecht and KATSU) and a medium in and of themselves (for example, Alex Rivera’s “LowDrone” and Bart Jansen’s taxidermy). Drones have been useful to artists working in different media and fields including photography, painting, audio-visual art and live performances (as in shows by Cirque du Soleil and Japanese dance troupe Eleven Play). While drones do present exciting means of expression previously unavailable to most artists with modest budgets and little technical training or interest, these drone operators do recognize the unique challenges and risks posed by using the aircraft in their artwork. For example, in 2014, Brooklyn-based graffiti writer KATSU, who has long been on the cutting edge of graffiti innovation, having previously invented the highly influential fire extinguisher spray can, developed a graffiti drone – a quadcopter with an attached aerosol can. Although he has yet to perfect his graffiti drone, he has expressed an intent to use the aircraft to bring his unique brand of art to otherwise inaccessible areas in public view hundreds of feet above the street. However, KATSU’s work may be for naught if the FAA’s forthcoming regulations ground his drone before it can revolutionize the graffiti world. 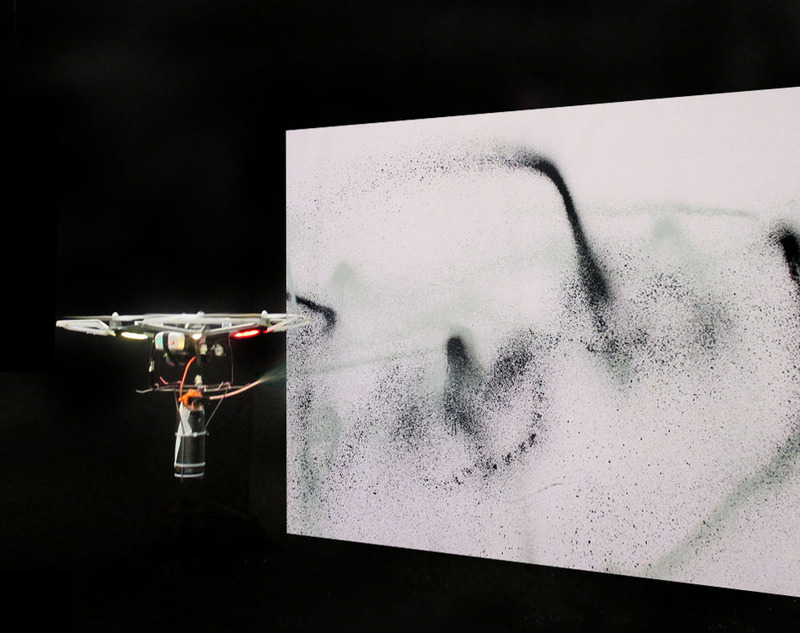 In an interview with Bard College’s Center for the Study of the Drone at a 2014 showing of his drone-created paintings, KATSU acknowledged the novel dangers of using the technology in graffiti, explaining that his traditional graffiti only involves risking his own safety whereas a major concern of using drones is “losing control and having it fly down and hit a woman in the head, or…kill someone.” In addition to injury prevention, the FAA has interests in national security, air traffic control and privacy which could be advanced by regulating noncommercial drone use. Indeed, the line between commercial, regulated use and recreational, unregulated use of drones can be difficult to identify in the art world. If an operator pilots a drone for use in taking photographs for her own amusement and then later sells those photographs for a modest sum, is she a recreational operator a commercial operator? Some, such as art critic and journalist Benjamin Sutton, have speculated that the new legislation would eliminate such gray areas by applying the same rules to commercial and noncommercial operation. The legislation may also codify the FAA’s voluntary safety standards for drone operation which, among other suggested “best practices,” encourage operators to not fly near people or crowds, to keep their drones below 400 feet, to give way to full-scale aircraft and to not hesitate to ask for assistance from air traffic control towers in flying safely. The regulations might additionally confine operation to daylight hours. Commercial drone operation is not absolutely prohibited, however. Under Section 333 of the FAA Modernization and Reform Act of 2012, unmanned aircraft can be used for commercial purposes only if they are granted a certificate of airworthiness by the FAA. In order to grant permission for commercial operation under Section 333, the FAA requires that the operation does not pose a threat to other airspace users or to national security, that there is an “observer” separate from the pilot, that the aircraft remain within sight at all times and that the pilot has at least an FAA Private Pilot certificate and a current medical certificate. To date, the FAA has received 342 requests for Section 333 exceptions and has granted only twenty-four. There is also an exception under Section 334 of the Act allowing federally funded entities, referred to in the statute as “public entities,” to operate drones, which could theoretically allow for continued drone usage in public arts projects. Until further details come to light, the effects on the art world of the forthcoming legislative revisions are still very speculative. If it were to approach noncommercial drone use the same way that commercial use is handled under current regulations, it would be very difficult for private artists to employ drones in their artwork without running afoul of FAA regulations. However, if the legislation were to only codify the voluntary safety standards, it would not likely be very restrictive of artists’ ability to utilize drones to a reasonable extent. FAA’s general homepage for drone info: Unmanned Aircraft Systems, Fed. Aviation Admin., http://www.faa.gov/uas/ (last modified Feb. 04, 2015). 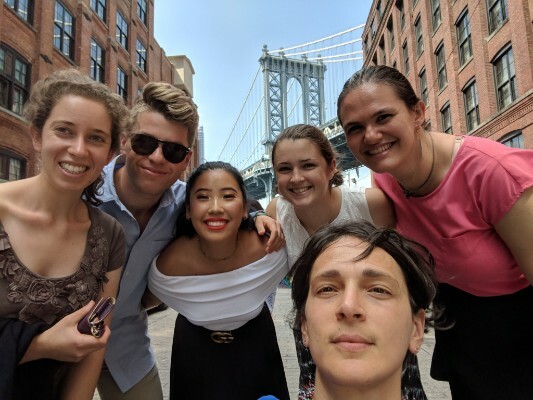 About the Author: Dennis C. Abrams, Legal Intern with Center for Art Law, is a 3rd year student at Benjamin N. Cardozo School of Law, concentrating in intellectual property, media, art, entertainment, and sports law. He can be reached at denniscabrams@gmail.com. Disclaimer: This and all articles are intended as general information, not legal advice, and offer no substitute for seeking representation. I don’t know what the source of the information that The Art Newspaper is reporting, but that’s just not how the FAA works. The FAA does not make law, Congress does. The congress makes laws then the Federal Agencies promulgate the rules and regulatory framework to follow the law that Congress makes. Even if the FAA has a problem with the current state of the law, they aren’t the correct body to make any recommendations to Congress. That would be the National Transportation Safety Board. Making recommendations to Congress is what they do. Thanks for reading and commenting. The FAA submits recommendations for regulations to Congress via the Department of Transportation. The Art Newspaper’s sources were never made clear.